Fact Checking Uber On Labor Laws : All Tech Considered A law passed by Seattle that allows Uber and other contract drivers to organize raises many legal questions. But despite claims by Uber, labor experts say, it has real teeth. Let's start by fact checking David Plouffe. The policy guru at Uber — who used to be the campaign guru for President Obama — did an interview with NPR last month. 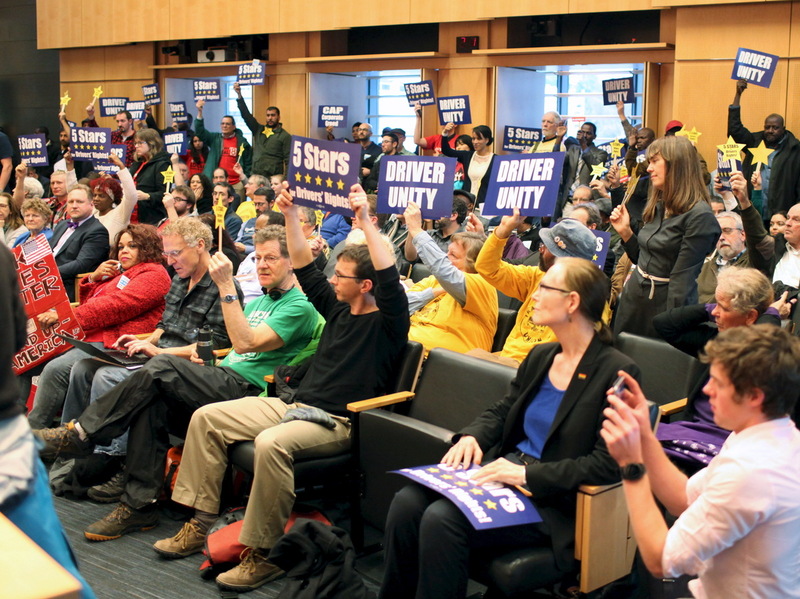 On the right to unionize, as Seattle was proposing, Plouffe said, "Well, there's very clear federal law on this, that independent contractors cannot be organized. [So] that's clear." Well actually, it is clear that he's wrong, according to some labor experts. Matthew Finkin, a labor law professor at the University of Illinois, adds: "Because [contract workers are] excluded from federal coverage doesn't mean the federal law meant for them to have no rights at all. What rights they're able to assert could be provided by state law or in this case municipal ordinance." The Supreme Court decided in two landmark cases (in 1959 and 1986) to limit how much action state and local governments can take on labor matters, ruling they can't regulate where the NLRB has jurisdiction. The federal right to unionize covers workers classified as "employees" and does not cover three big categories: farmworkers, domestic workers and independent contractors. By that logic, Liebman and Finkin say, the drivers aren't covered by the federal statute. But it's not as though Congress intended for these groups to have no rights. According to Liebman, contract drivers are fair game for states and cities to weigh in and plug in the holes left open by the feds. That's what California did with farmworkers in the 1970s. "I don't think anyone has ever said California can't do that," Liebman says. Uber declined NPR's request to comment on or clarify the statement by Plouffe. Putting aside labor laws, critics of the Seattle law could raise antitrust issues. If drivers are contractors, legally they're like solo doctors, Finkin says. "Let's say doctors [all] band together and they say, 'We will agree that none of us will accept less than $1,500 for a knee operation. We're fixing the prices of knee operations.' "
That would be illegal. But, Finkin says, the Seattle law was written quite cleverly. If drivers and the company wanted to change the rates for customers, they'd have to go before a city officer (the director of finance and administrative services). So arguably, they can't fix prices. "Any agreement they make with Uber has to be approved by the city." In court, the legal experts say, Seattle's law has real substance. In real life, however, it may not get used. Very few workers — those classified as employees — exercise their right to collectively bargain. And only 6.6 percent of private sector workers are even in unions. Arguably, the campaign in Seattle is a bit like fighting to own a gun that doesn't shoot. "I don't know how many people you need to actively bargain in order to make it an important factor in a labor force," says venture capitalist David Cowan, with Bessemer Venture Partners in Silicon Valley.